A teen girl was taken to a hospital after a Morgan Hill police officer accidentally shot his gun and a bullet fragment hit her near her eye on Sunday evening. A 16-year-old girl was taken to a hospital after a Morgan Hill police officer accidentally shot his gun and a bullet fragment hit her near her eye on Sunday evening. The shooting happened after a short pursuit involving a stolen van beginning at 7:30 p.m. in Cochrane Plaza. Officers ended the chase in the area of Llagas Road and Del Monte Avenue after forcing the vehicle to spin out. The girl and another 15-year-old girl who were passengers walked out of the van toward police and were told to get on the ground. At that time, an officer accidentally shot his gun into the ground and a bullet broke apart, police said. The fragment hit the 16-year-old near her eye and she was taken to Lucile Packard Children's Hospital in Palo Alto. The bullet fragment was successfully removed, according to police. 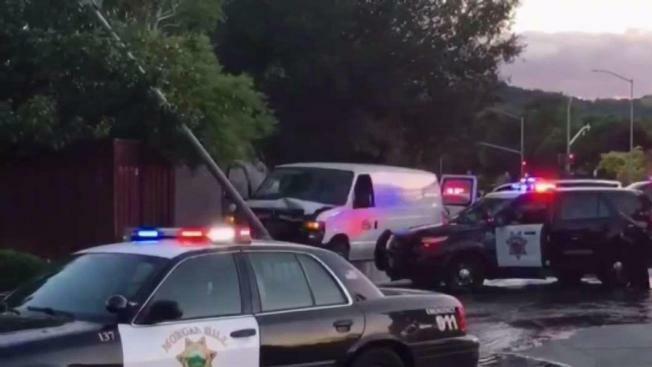 The 15-year-old girl was injured when the 16-year-old male driver of the vehicle hit a fire hydrant at the end of the pursuit, police Chief David Swing said. The driver was arrested on suspicion of possession of a stolen vehicle, reckless evasion, fleeing from police causing injury and an outstanding probation violation warrant and was booked into juvenile hall. All three teenagers were taken to the hospital and released after they were treated for injuries. The officer, a 23-year veteran, is currently on paid administrative leave while police complete an investigation into why he shot his gun, Swing said. The standard leave period is one week, but it will depend on the length of the investigation, according to Swing. He said the name of the officer will not be released.